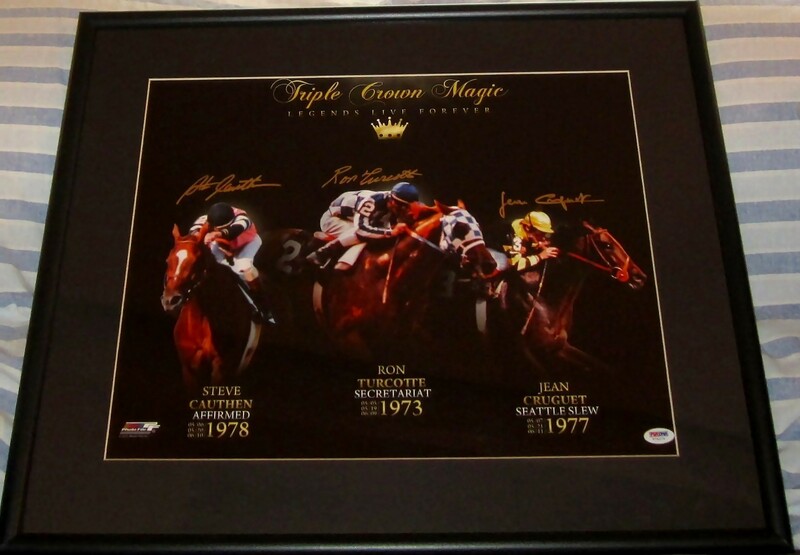 Triple Crown Magic 16x20 inch poster size photo autographed beautifully in gold paint by legendary jockeys Steve Cauthen, Jean Cruguet and Ron Turcotte (who of course each won horse racing's most coveted title aboard Affirmed, Seattle Slew and Secretariat, respectively. Matted in charcoal and framed with plexiglas in black wood, ready to hang with attached sawtooth hanger. Hanging hooks and wire are NOT INCLUDED but NOT NECESSARY. 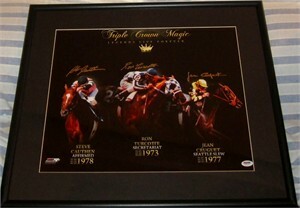 Witnessed and authenticated by PSA/DNA with their matching numbered sticker and certificate of authenticity. ONLY ONE AVAILABLE FOR SALE.